One of America’s most hallowed publications also has one of the best news apps. 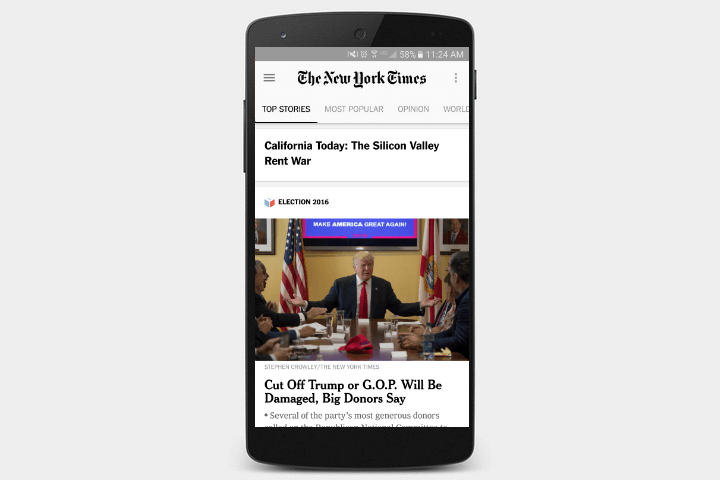 The NYTimes app arranges the publication’s content in a clean format and allows users to customize their newsfeed. 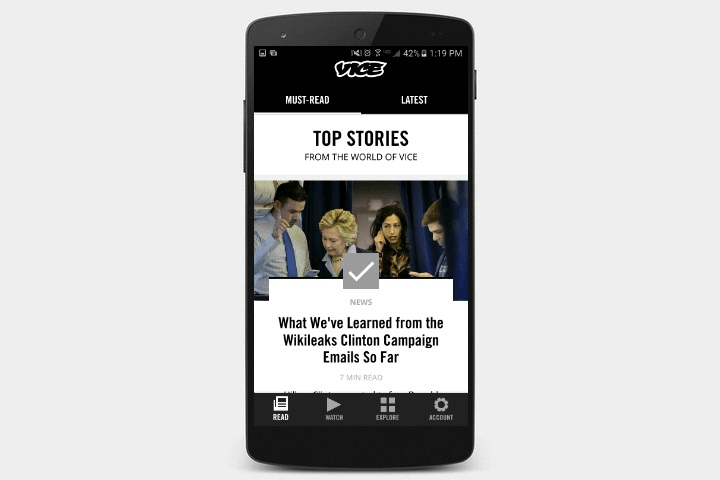 If you prefer journalism that leans toward gonzo, Vice offers its robust library of written and video content in an app that is elegant and easy to navigate. 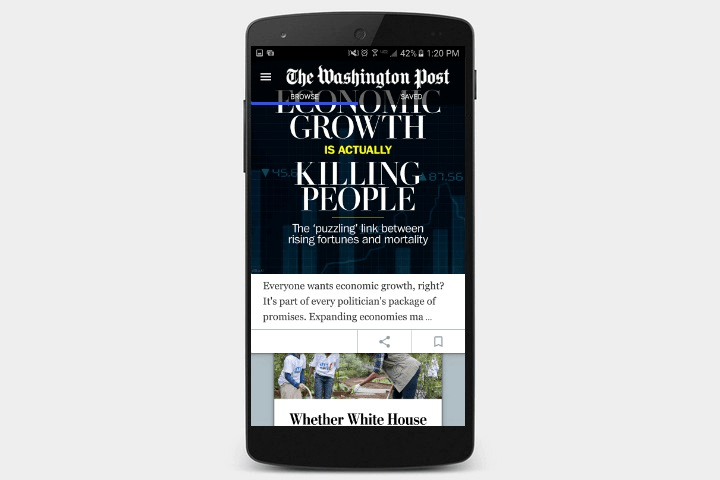 The app includes estimated reading times, so users with a time-crunch can prioritize articles to suit their schedule. 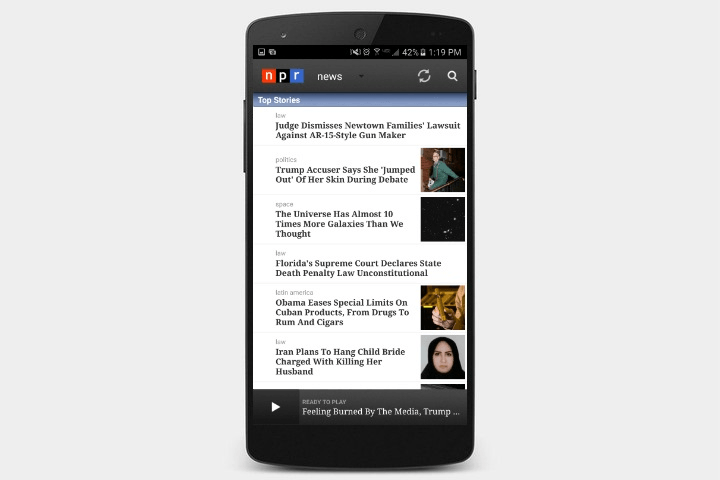 The official app of National Public Radio provides a steady stream of straightforward reporting in both print and audio. Users can not only listen to news reports, but also various programs such as All Things Considered and Radiolab. One of America’s most noteworthy papers has a beautiful mobile app, with vivid images and colorful menus. The content is also top-notch, particularly the incisive political reporting. The app requires a subscription. Ever feel like there’s just too much news to keep up with? Nwsty might well be the app for you. It’s aimed at those who don’t often read the news, and makes it easy to keep up with the daily headlines without spending too much time on them. Each day, you get six to 10 headlines in your digest that you can quickly and easily read in a matter of only a few minutes. Whatever gets you excited, from NASCAR to the NFL, theScore will have you dancing in victory or crying in your beer. It brings you all the latest touchdowns, goals, and home runs as they happen. Having the official ESPN app installed is a no-brainer for any die-hard sports fan. You can quickly get the latest news on your favorite teams and leagues, including MLB, NFL, NCAA, MLS, NHL, and more. Not only does the CBS Sports app have the latest news, standings, and scores for all major league sports, you can also watch live games and events like NCAA basketball and the PGA Tour, as well as CBS Sports original programming, like Fantasy Football Today. Whether your league is football, baseball, hockey, or basketball, the Yahoo! Fantasy Sports app will give you everything you need to indulge in your fantasy play, including mock and league drafts, advice from experts, and easy management tools. Instagram is ubiquitous in photography now, so you might as well have it on your phone. Owned by Facebook, the social network centered on photos offers great filters and connectivity with others. The biggest social network on the planet right now has a decent official app. Keep up with your friends and family, jump into instant chats, and stay informed with push notifications. Twitter’s microblogging platform brought about the now-ubiquitous internet facet, hashtags. Connect with your friends, share your new favorite content, follow celebrities, and get breaking news as it happens. The original VOIP service is now owned by Microsoft and boasts more than 250 million users. Free international voice and video calls via your data or Wi-Fi connection is hard to pass up. Facebook’s best feature is arguably its built-in messaging. Facebook now offers its messenger service as a standalone app, enabling you to chat with your Facebook friends and anyone in your contacts with the app installed — without having to be signed into Facebook, or even have Facebook installed on your phone at all. This cross-platform app lets you send and receive messages, pictures, audio notes, and video messages. It starts out free for a year, and then costs $1. It’s well worth a look for texting addicts. Snapchat is all about sharing photos, short videos, and conversations that expire automatically after they’ve been viewed. You can use filters, decals, and effects to enhance your photos and videos, and take your Snap game to a whole new level. Facebook Messenger Kids might seem like it’s built for kids, but it’s really built for parents. With the app, parents have control over their kids’ contact list, and messages can’t be deleted — meaning that parents can check in to take a look whenever they want. Of course, there are some pretty sweet features for kids, like kid-appropriate stickers, GIFs, emojis, and so on. Tinder is the ultimate dating app for mobile users, thanks to its location-centric features. Regardless of what its reputation may be, it’s still a great way to meet people. Your next match could be a swipe right away. OkCupid is one of the biggest dating apps around, so you’ll have plenty of chances to meet someone. Fill out your profile, answer questions about yourself, and connect with people nearby to see if you hit it off. This app is geared toward those who are looking for a real relationship, rather than a quick hookup or short fling. Every day at noon, you get sent a prospective match based on a specific set of criteria. You can Like them or Pass on. If you like them, you’ll be set up with icebreaker questions; if you pass, the app will learn your preferences and try again tomorrow. Happn connects you with others you’ve passed in real life, making that shared glance at a coffee shop into a potential date. You can browse profiles of those you’ve crossed paths with, and if you both “like” one another, you’ll be able to begin a conversation. Don’t worry if you don’t have a Kindle — you can still read your ebook directly on your smartphone. From best sellers to the classics, it’s all here, with more than 900,000 titles in Amazon’s store. Comixology’s free app is a window into a staggering library of more than 40,000 titles, including all the big names from Marvel and DC. It’s the biggest comic book reader out there right now. While primarily a comic book reader/library management app, Perfect Viewer also functions as a PDF viewer, ebook reader, and image viewer. It can be connected to Google Drive, DropBox, or OneDrive to access your library, and is one of the best options for side-loading your digital comics and books. Medium is a high-profile yet minimalist blogging platform that anyone can use. Due it its popularity and presence, it draws numerous well-known journalists, authors, actors, and other personalities to the platform, meaning you’ll have a stream of high-quality articles and essays to read whenever you want. The Tumblr app makes it easy for you to share anything from anywhere. You can post any kind of content to multiple blogs, save drafts for later, schedule posts, and then join in the discussion. This app mirrors the functionality on your WordPress blog and helps you create and edit posts. It’s a simplified version that’s easy to use, and it also displays reactions to your latest articles. This is the official app for one of the longest running and most popular blogging platforms on the internet. Through the app, you can compose, edit, and post directly to your blog, and swap easily between multiple blogs if you happen to have more than one.